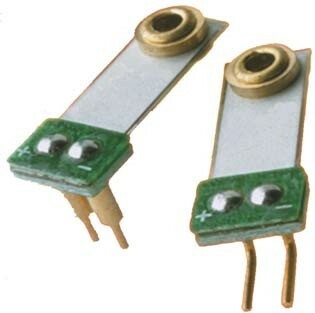 These sensors are laminated, a 0.005” (125µm) polyester layer is laminated to a 28 µm or 52µm piezo film element. When used in a ‘bending’ mode, laminated film elements develop much higher voltage output when flexed than a non-laminated element series. 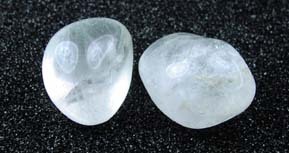 The neu- tral axis is in the laminate instead of in the film so the film is strained more when flexed. The capacitance is proportional to the area and inversely proportional to the thickness of the element. 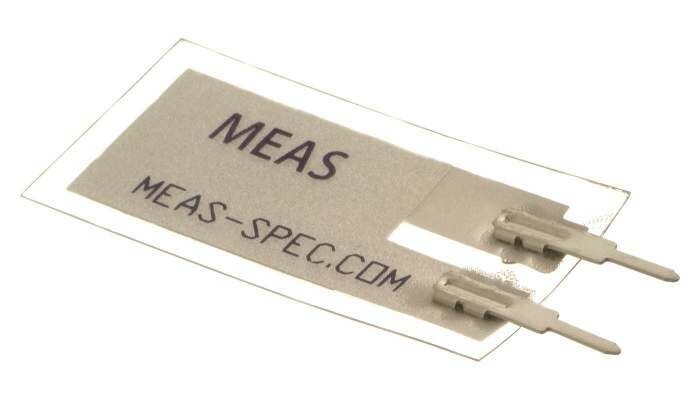 These piezo film sensor elements are rectangular elements of piezo film with silver ink screen printed electrodes. Lead attachment is accomplished using a riveted lug going to 12” (300 mm) of 28 AWG wire. 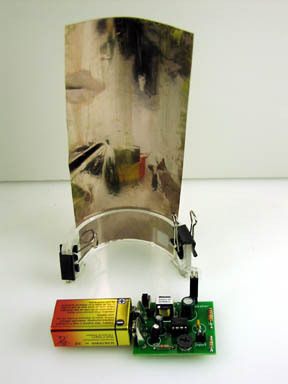 The film element produces more then 10 millivolts per micro-strain. The capacitance is proportional to the area and inversely proportional to the thickness of the element. The elements are supplied with a thin urethane coating over the active electrode area to prevent oxidation to the top surface of the silver ink. 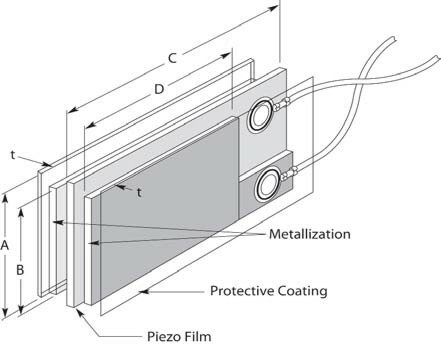 Piezo Film Solid State Switches Piezo film’s capabilities to generate a high voltage output under bending strain, combined with its rugged form factor, make it an ideal candidate for solid state impact switches. The PZ-05 providesa single digital pulse that is ideal for triggering digital circuits and signal processing. 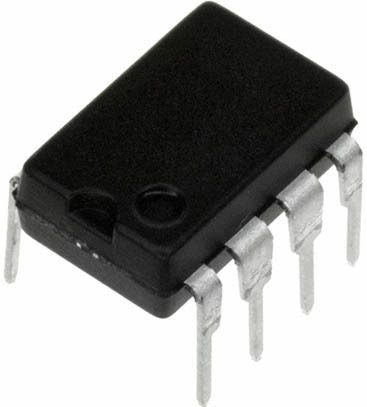 The imperviousness, elasticity and reliability of the PFS element, along with the noise rejection characteristics of the circuit, combine to provide the PZ-05 withfeatures that suit applications demanding consistent, reliable performance throughout tens of millions of switching cycles. 28 μM, 52 μM, and 110 μM thick with Silver Ink or Ni/Cu metallization. Available in 8" x 11"sheets. Piezo cable is another form for piezo polymer sensors. Designed as a coax cable, the piezo polymer is the “dielectric” between the center core and the outer braid. When the cable is compressed or stretched, a charge or voltage is generated proportional to the stress. Piezo cable has a number of advantages in certain applications. Due to its coaxial design, the cable is self-shielded, allowing its use in a high EMI environment. 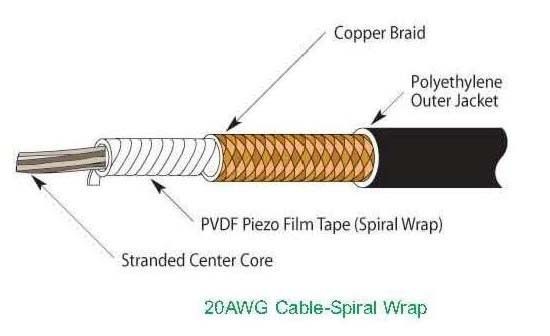 The piezo cable can be spliced to passive coax, using standard coax splice techniques. It is extremely rugged, and will stand up to heavy loads. PZ-07 - $19.35 / ft. 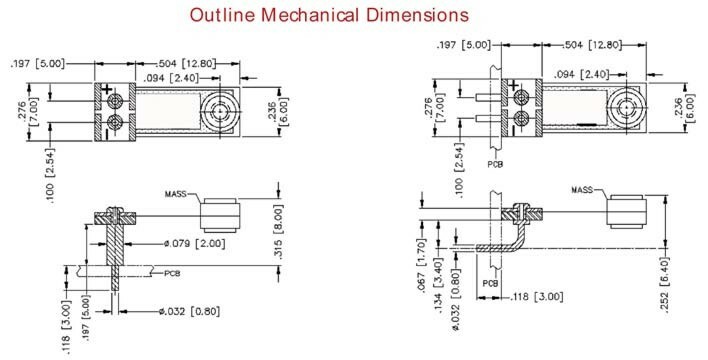 The PZ-08 and PZ 09 is a low-cost cantilever-type vibration sensor loaded by a mass to offer high sensitivity at low frequencies. 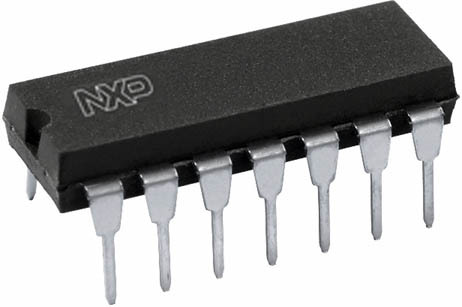 Pins are designed for easy installation and are solderable. Horizontal and vertical mounting options are offered. 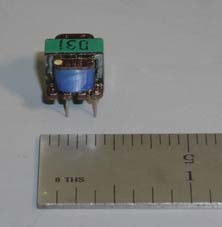 The active sensor area is shielded for improved RFI/EMI rejection. Rugged, flexible PVDF sensing element withstands high shock overload. Sensor has excellent linearity and dynamic range, and may be used for detecting either continuous vibration or impacts. The PZ-08 and PZ 09 acts as a cantilever-beam accelerometer. When the beam is mounted horizontally, acceleration in the vertical plane creates bending in the beam, due to the inertia of the mass at the tip of the beam. Strain in the beam creates a piezoelectric response, which may be detected as a charge or voltage output across the electrodes of the sensor. The sensor may be used to detect either continuous or impulsive vibration or impacts. For excitation frequencies below the resonant frequency of the sensor, the device produces a linear output governed by the "baseline" sensitivity. The sensitivity at resonance is significantly higher. The piezofilm speaker kit is both educational and fun. 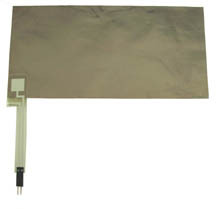 The piezoelectric material is a thin flexible plastic sheet with metalized surfaces. When voltage is applied the piezofilm changes size. The kit incorporates a LM386 integrated circuit that amplifies an electrical sudio signal from an IPOD or similar device, and outputs the amplified signal to the piezoelectric film which generates audible sound. For information on how the Flicker Light functions go here. Click here to read articles on piezo products!